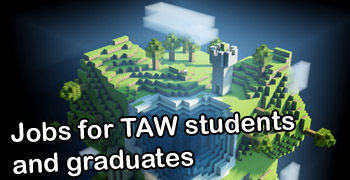 TAW-Games: This week in jobs: Limbo and project based openings! This week in jobs: Limbo and project based openings! Vacation is over, time for information overload! The Alexandra Institute in Aarhus are looking for a Technical Director for a 4-month project based employment. - Able to identify areas where the visual aspects of a proejct can be improved. - Know, and/or have worked with commercial films/TV or game productions. Write to Jesper Mosegaard for more details - jesper.mosegaard@alexandra.dk, subject: "Application TD 2012"
Portaplay are looking for a "cool and quirky animator" for a 3-month project based employment. The project is still in the pre-development phase and are mostly "un-proven ground", meaning that we will rely heavily on prototyping and iterative processes. –and this is where we need you! We are often combining tech in odd ways, to create new user experiences, so be prepared to "boldly go where no man has gone before" (or woman). Your work will center around experimenting with new ways of creating animations, which conceptually unite the animation series and the game. -helping us create an artistic vision and a setup, that makes the film and game comes together visually - communicating the same universe, while telling different stories on each media. If you know of more jobs, feel free to drop a line in the comments, and I'll add them to the list!